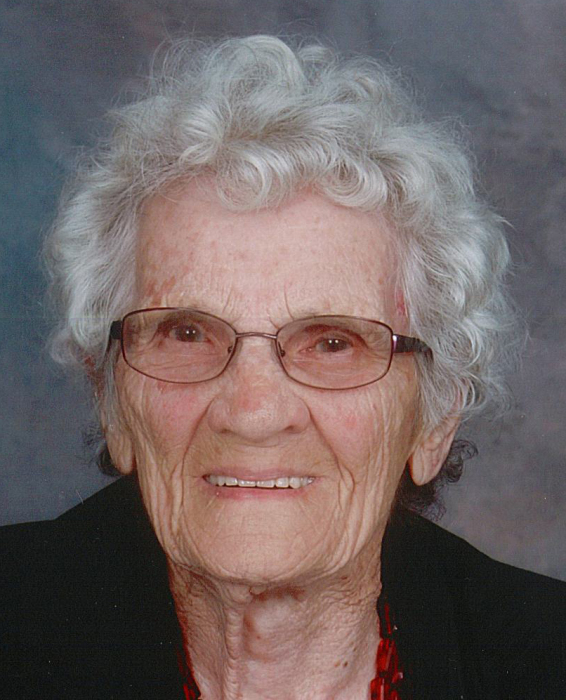 Theresa Pawluk passed away peacefully after a brief illness at the Rossburn Personal Care Home on December 30th, 2018. She had joyously celebrated her 97th birthday on October 19th, 2018, surrounded by her family, special friends, and the PCH staff- the people she called her angels because of their excellent care over this last year. Theresa was born in the Municipality of Silver Creek to Basyl and Domitsella (Naherniak) Michalchuk, the sixth of 14 children. As a young woman, Theresa studied at the Normal School in Winnipeg, paying her way by working as a housekeeper in a home that hosted World War II soldiers. She was a teacher in a one-room schoolhouse called Chmelnycki, organizing the annual Christmas concert and, after hours, teaching Ukrainian dancing. On October 1st, 1944 she married Charles Pawluk and they farmed on his grandparents’ homestead in the Mears district for 38 years. Theresa fed her family with home-grown produce and laboured alongside her husband Charlie, growing crops and caring for livestock. There was always time for her beautiful flowers. She was a pioneering lady who drove horses, tractors, and in the 1950’s got her driver’s licence. She laughed about the running water she had on their farm – you ran the water into the house in pails and out again in pails. We remember her especially as an excellent self-taught and creative seamstress, and how she could carry a lovely tune in her alto voice. Many hours were spent at her sewing machine when she would beautifully hum her hymns and songs as she worked. They retired to Rossburn in 1982. Theresa continued to wholeheartedly devote herself to the people and tasks surrounding her. She volunteered at the Rossburn Ukrainian Catholic Church in many capacities including teaching Catechism and serving as president of the Sisterhood. She was proud of her 30 year pin recognizing her for her service as a member of the Ukrainian Catholic Women’s League. She joined the Ukrainian National Home choir and sat as a Deputy Returning Officer in a Municipal election. Theresa and Charlie worked as janitors at the TD Bank. She enjoyed the employees from the bank especially when they visited at Halloween, all dressed up and playing tricks. The children she babysat in her home call her Baba to this day, so loving and giving was she. She excelled at teaching; singing “Happy Birthday” in Ukrainian for her grandchildren and showing her great-grandchildren how to properly make a rhubarb pie. She was very proud of all of her family’s accomplishments. “Everytime someone dies, a library dies with them.” Theresa had a wealth of stories, so many years of history and change. Each new stage in her life was met with strength, always continuing to contribute her skills to the challenges she met. And yet, whenever someone visited there was time for laughter, a game of cribbage, and food to share. Theresa’s life was so full, so rich, so inspiring. 97 years of service, joyful and sometimes sorrowful, to her family, community, and world. Dearest Theresa, Mom, Baba, and Bushie, the world is a lot brighter for having known you. We love you. Morris (Pauline Kozak-Kowal), Olive (Roy Kohuch), Arthur Fanning , Marie (Walter Pawluk), Eugenia, Wasyl, and Marion (Stella Korniat). Charlie’s siblings and in-laws: Alex Pawluk (Pearl Spilchuk), Mike (Eugenia Wonitoway), Walter (Marie Michalchuk), Dan (Helen Gandza), Anne (Mike Halowski), and Mike Sotas. Theresa is survived by her sister, Maria Michalchuk; her sisters-in-law Jean and Wanda Michalchuk and Margaret Sotas; children, grandchildren, and great-grandchildren: Doreen (Harry) Boychuk, Jeff (Lisa Popowich); Diana (Mickey) Heneghan, David (Renise McLean), Tianna, Leifr, and Saffren; Dr. Erin Heneghan, Joseph and Samuel Kingdon; Shannon (Max) Peddlesden, Rhys, Charles, and Orson; Calvin (Val Cottingham) Pawluk, Justin and Jenny; Carol (Jim Henderson) Pawluk, Maggie and Anna; Audra (Grant) Nychuk, Jory and Chad; Alan (Jessica) Luhowy, Sierra and Matthew. Many, many more special nieces, nephews, and friends. The funeral service was held on Thursday, January 3, 2019 at 11:00am from the Sacred Heart of Jesus Ukrainian Catholic Church, Rossburn, with Father Mykhaylo Khomitskyy officiating. Interment followed in the Parish Cemetery. The pallbearers were: Audra Nychuk, David Heneghan, Justin Pawluk, Maggie Henderson, Shannon Peddlesden, and Jory Nychuk. The cross bearer was Joseph Kingdon. The eulogists were Jenny Pawluk and Shannon Peddlesden. Rae’s Funeral Service of Shoal Lake and Erickson were in care of the arrangements. The family thanks: the Rossburn PCH staff for their excellent care of Theresa during this last year of her life in the place she called her home with her “angels”; Val Cottingham whose care and friendship filled Mom’s life with such happiness; her special friends at the PCH; Dr. Roos, the ambulance attendants, Dr. Rola and staff at Russell Hospital; the Rossburn palliative care volunteers, Karen, Karen, Bob, and Marilyn; Father Mykhaylo Khomitskyy for his service, gentle compassionate visits, and his kind inspiring words for Mom; the Rossburn Ukrainian Catholic Women’s League for their rosary prayers and the beautiful honour guard for Mom; the cantor, Adele Mychasiw and her choir, the elder, David Sytnyk, the lunch ladies, and the excellent service of all the Church community; Thank you to Shauna and Rae’s Funeral Service for their helpful and kind guidance. Thank you to our family, friends, and community for all your loving condolences and support. Words can hardly express our appreciation. In lieu of personal thank you cards, the family has made donations to the Sacred Heart of Jesus Ukrainian Catholic Church and the Rossburn Personal Care Home.